Small cosy family owned setting with a caring team, providing care and education from birth. High quality flexible childcare where fantastic relationships with parents are encouraged. Beautiful and engaging outdoor environment consisting of Paved and lawned garden which is secure and attractive offering lots of sensory experiences. Fully qualified and fully vetted staff only all with paediatric first aid training. 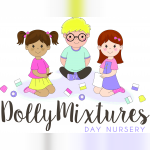 Below are the latest reviews for Dollymix. Please note that reviews represent the subjective opinions of other Childcare.co.uk users and not of Childcare.co.uk. Parents must carry out their own checks and references on childcare providers to ensure that they are completely happy before enaging in the use of their services. we had recently been let down with a childminder she gave us no notice. I rang up dolly mixtures and they were lovely and completely understanding how stressful it was getting childcare. The managers made me feel at ease and within a week or so he has started. All the staff we have seen, were in uniform and looked smart. we had also met the cook and have seen the menu's for the month. my little boy had just had his settling in day and i was happy to know, they inform me how he was and even though it was a busy morning in the baby room i could see that things were controlled and done correctly with the understanding that every child is different and requires different attention.